Beattie's Book Blog - unofficial homepage of the New Zealand book community: The first review of Dan Brown's Inferno - embargo broken? 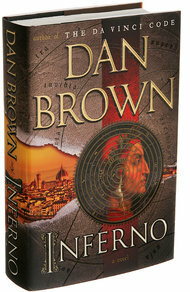 The first review of Dan Brown's Inferno - embargo broken? One of the first characters to appear in “Inferno” is a spike-haired, malevolent biker chick dressed in black leather. She looks like trouble in more ways than one. 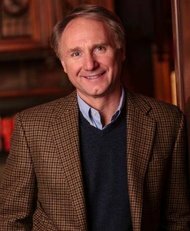 What is the girl with the dragon tattoo doing in Dan Brown’s new book? She’s scaring Robert Langdon, the tweedy symbologist who stars in Mr. Brown’s breakneck, brain-teasing capers. Reader, she will scare you too. The early sections of “Inferno” come so close to self-parody that Mr. Brown seems to have lost his bearings — as has Langdon, who begins the book in a hospital bed with a case of amnesia that dulls his showy wits. When Robert Langdon of “The Da Vinci Code” can’t tell what day of the week it is, the whole Dan Brown brainiac franchise appears to be in trouble. But “Inferno” is jampacked with tricks. And that shaky opening turns out to be one of them. To the great relief of anyone who enjoys him, Mr. Brown winds up not only laying a breadcrumb trail of clues about Dante (this is “Inferno,” after all) but also playing games with time, gender, identity, famous tourist attractions and futuristic medicine. Then there’s the bit with the symmetrical clockwise Archimedean spiral, which will have people slowly rotating their copies of “Inferno,” trying not to look silly as they scrutinize the rounded calligraphy on Page 255. There is even a twist built into its 14/5/13 publication date, a numerical anagram of the 3.1415, the approximate value of pi. Why? Because Dante divided hell into circles. Because pi is a hint about measuring them. And because Mr. Brown’s readership has never met an embedded secret it didn’t like. As is his wont, Mr. Brown begins with a crazily grandiose prologue, this one a little more unhinged than usual. “O, willful ignorants!” exclaims some mystery figure. “Do you not see the future? Do you not grasp the splendor of my creation?” That said, this guy with a God complex leaps off a building — or, as “Inferno” puts it, takes his “final step, into the abyss.” And then Robert Langdon’s beautiful, ponytailed doctor yanks him out of bed so they can begin racing breathlessly through ... where? This may well be the first review to appear anywhere. The rest of us plebs have to wait until publication day (today) before we are even allowed to see a copy - May 14 ! The book is simply incredible, although at some place you will feel an overlap between Da Vinci code and this book. It also has some factual errors like the quote of Robert Oppenheimer from Srimad Bhagavad Gita. But these negatives, doesn't let this book down. Robert's effort needs to be appreciated.